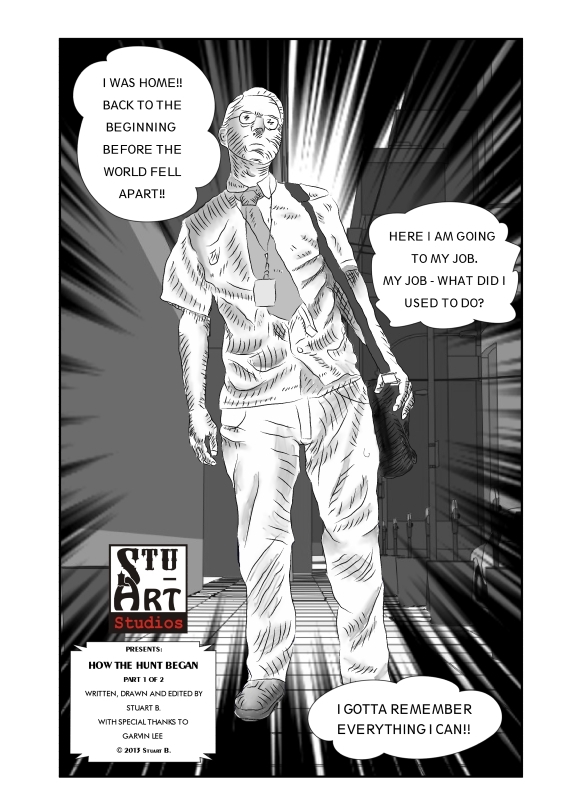 Let our story begin…Smithee finds himself back in the pre-apocalyptic world of traffic and time-clocks.Back when he was just a regular Joe working 9 – 5 and worrying about bills instead of zombies!Who was he in that forgotten time? What was his real name? So begins the 1st page of the new book. I had fun doing this totally in Manga studio. And I did the values layer just for fun, but man it really makes things have depth. Darnit, now I’m going to have to do that for the rest of the blasted book! So, I am going to lay this out in long format instead of the customary 4 panel web format since the end product is going to be a regular size comic.